Online competition is intense. Close to 2 million blog posts are published every day. That’s a lot of content. A bit discouraging, isn’t it? But take a moment to think about the nature of competition. Online competition is based on topics. In Google, in social media, and in the minds of your audience, competition for attention is always specific to a topic. Popular topics are crowded with competitors: famous blogs, big companies and sites that have invested in content for years. If the topic is small, small websites can win attention, but it may not be enough to generate leads and sales. It’s hard to thrive in a tiny, micro-niche. So How Do You Beat the Competition For Bigger Topics? First, you have to understand this: those bigger competitors win because they have more content and better content. This is how they become relevant for that topic in search engines, in social media and with their email subscribers. So to compete, you need to focus on a topic and build up a set of content around it. You need to be more organized and focused. To beat the big boys, you need content hubs. When content is focused on a topic, it piles up, reaching higher above the competition and gaining visibility. 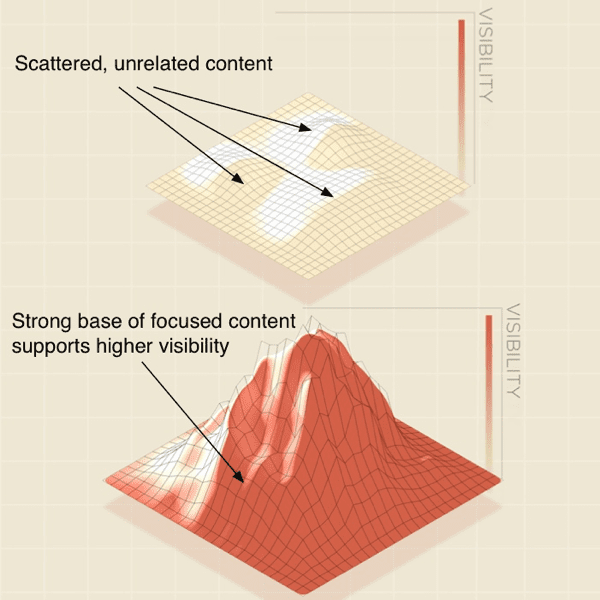 If a content hub were drawn in 3D, it would look like a mountain, with a central peak surrounded by a wide base of sub-topics. Most marketers aren’t very focused. They publish a bit here and a bit there. These are just small hills that never rise high enough to be visible. So What’s a Content Hub? A content hub is a set of content (usually web pages) organized around a specific topic (usually a central page). It could be a category on a blog or a section of pages on a website. So content hubs are relevant to both web design and ongoing content marketing. Website sections are content hubs for related services. Ecommerce product catalogs often resemble content hubs. Make sure to use descriptive navigation and pay close attention to internal linking. See How to Make a Sitemap for details. Blog categories can be topic-based and often serve as content hubs. A publishing calendar can focus on a specific topic for a specific time frame. Content hubs are the key to winning attention in a crowded field. They work because they have a structure: a wide base around a high center. DON’T: Build a pile of medium quality blog posts that all say similar things. DO: Create a well organized hub of diverse assets, in many formats, in many places, created by various people. “What” you publish should vary. Appeal to your audiences’ various learning styles using various formats: blog posts, guides, videos, infographics, audio, etc. “Who” creates this content? You don’t have to do all the work. Co-create content with people your audience trusts, people who have already built an audience that overlaps with yours. Collaborate with influencers. 2. Check the competition by searching for the phrases in Google. Use the MozBar to see the domain authority of the high ranking sites. Use Link Explorer to check your own domain authority. Normally, you’d need an authority in the high end of the range of the high ranking sites. But since we’re building an entire hub of content, we can win even for the more difficult phrases. 3. Find the influencers who are relevant for these topics with your audience. You want to start making friends with these people early in the process. Follow them, share their content, comment and do anything else that slowly wins their attention in a positive way. 4. Publish the central hub. This will be the center of the content hub. Make it your simplest, strongest and most useful piece of content on the topic. Optimize it for the most valuable and competitive keyphrase. Give it a clear call to action. 5. Publish supportive content. Put your best advice out there. Each piece can target its own phrase, which are subtopics of the central hub. Make sure to create visual content that looks great when shared on social networks. Also, make sure everything links back to your hub. Use the target phrase for the hub in some of the links. Note: Big thanks to Lee Odden of TopRank Blog for his clear-sighted presentation about influencer outreach at Social Media Marketing World. Inspiring as always, Lee! 7. Publish on other websites. Pitch related posts to relevant blogs and media sites. These could be alternate versions of content you’ve published, created through a process of ethical content spinning. In each case, they should link back to the hub. By the end of the process, you should be able to check Analytics and see if you’re winning attention. It will look like a steady stream of search traffic for the related phrases, and small spikes of social traffic each time something is published. If you’re not winning, you’re not done yet. Build higher. If you are winning, congratulations! You’re relevant for the topic. Now go build another content hub. Why Do Content Hubs Work? As Google gets smarter, they’re focusing less on keyphrases and more on the meaning, as in topics. The fancy name for this is “semantic search” and Hummingbird is the code name for the new version of Google that does this.So content hubs align perfectly with the direction Google is going. If you’ve been blogging for a long time, but you’re not getting much search traffic, this may be the problem. You’re not deliberately creating sets of content, organized around central topics. Every social stream is a curated list of posts and conversations. If you direct this stream toward a specific focus, you’ll gradually earn followers and attention from people who care about the topic.Now your network will grow in that direction. You’ll make friends with people who are relevant to the subject, increasing sharing and building more useful relationships and opportunities to collaborate. When visitors come to learn about a topic, one page may not be enough to satisfy them. But if they find themselves in a hub of content, they’ll dig deeper, increases the average pages per visit and average time on site.Give them more and you’ve got a better chance of being top-of-mind when people think of the topic. Eventually, when people ask “Where was that site that had all that great information on how to do this?” …they’ll think of you and they’ll come back. Orbit Media builds two kinds of websites: ecommerce sites and lead generation websites. Knowing it would be worth a serious effort to win attention for “lead generation,” we decided to target the topic. But the competition for that topic is fierce. So we knew that a page alone would not be enough. We needed a small content hub. This content was published over several months in several formats on several sites. The central hub was published first on the Orbit site, and subsequent posts all link back to it. We emailed some of these to friends who write and share this kind of content and invited their input. First page one in Google for “lead generation website,” alongside some very famous websites. A steady stream of 20-40 visits per day from search. These visits would cost $23 per click if we bought them using Adwords. That’s about $700 worth of free traffic per day. Around 10,000 total visits, including email marketing, social and referral visits. That last number has the added benefit of making our entire domain more credible, making the next mountain / content hub easier to build. Nothing is hard or easy. But some things take longer than others. When the attention is valuable, it takes longer to win but it’s worth the effort. If you’re surrounded by mountains, build tall. Be focused and organized. Build a small mountain of helpful information. Be the Wikipedia for your industry. Be the People Magazine for the influencers relevant to your audience. Don’t make a page, make a section. Don’t write a blog post, write a series. Honored to see you here in the comments! Fantastic post Andy. Validated the content projects we are working on at Base in creating varied content around specific topics. Focus is key. We’ve also had great success with content partnerships with Influencers in our industry. Will be sharing this post! Thank you! I need to check out Lee’s presentation too! This is just grade A info across the board. This type of information in any other field would cost big money. Andy, your post has caught the attention of our C-suite. Very good post and speaks directly to what we are trying to accomplish. Thanks for a great post! Thank you for making this so much easier to understand. I had read that keywords were not so important any more for Google searches but I didn’t realise just how much content mattered. I love that Bruce Lee quote. I might try to work him into more posts. I’m glad you and Adam liked this one. I truly believe this is one of the most important lessons in marketing. Pick a battle you can win and then fight until you win it! Focus, structure …and 10,000 kicks. Home run. Amazing. A little daunting, though, for my tiny little company that is swimming in a sea of “Social Media Marketers”. I’m plugging away at building my tiny mountain, but probably need to zero in on a niche to even make a ripple, no? I do, however, have lots of clients with more specialized, unique services and I can use these strategies to help them rise in the Google ranks. Thanks so much for this! Oops…meant to comment above via my Twitter account. I can see why it seems intimidating, but maybe it’s just a matter of sketching out an outline of topics at first, then planning the formats, co-creators and places to publish. If you stay focused on those topics and sub-topics long enough to build up the base, you’ll gradually become relevant …and then dominant. Maybe this is all just another look at content strategy. Thanks for the comment and the shares, Jen. Always nice to see you here! Wow. Ever notice when somebody comes along with the right idea you just wind up thinking “wow How come that never crossed my mind” it’s brilliant elegant and simple. This says it all about your approach, Andy. For super-competitive keywords like that you need to make your site THE hub for that topic. Definitely takes a lot of focused investment in terms of creating killer content, but as you’ve pointed out, the ROI is hard to beat. That was a great post Andy, I’m glad Ryan Diess of Digital Marketer pointed me to this post. Thanks for dropping by, Genero. I don’t know Ryan, but I’m familiar with Digital Marketer. They’re putting out some great content! Thanks, Ryan. Glad you liked this one. If you come down to Chicago sometime, let me know! Great post Andy! Most blogs tend to just expound on the importance of creating content, but your post gets deeper into the “how-to”. Thanks! What’s your advice for people who have extremely limited time and resources to create content? Rock solid, Andy. Thank you. Such a great article! Quick question: if I have identified several content hubs, how should I prioritize them? Should I start with the less competitive topics and then move to more competitive ones, or do the opposite? Thanks a lot! I’ve clicked on the link on probably the 10th occasion I’d seen it. Didn’t do better action in a very long time. Genius! Andy, I have one question. Owned content should come first at communication. But how if the service is so new that no one searches for it? Than you can make a brililant content hub with simply no visits. What would you recommend?